As my personal time becomes better, work on Faur orders starts again. The railling wires are now formed with a new method for better and faster results. 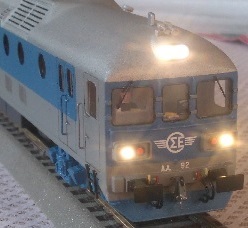 I saw on Facebook that also somebody else is offering a Faur 151 besides Limitbahn and you. Whats the catch? I attach three photos of the second Faur group with the wires recently attached. All the models look very good. Please ignore those individuals who seek negative attention in order to acquire a free publicity platform. We all know who they are, who follows them and who speaks on their behalf. Lets leave it at that and let us enjoy our love of Greek modelmaking and collecting in this forum. PS. I still look forward to be receiving mine. I might even come down to Athens to collect it.